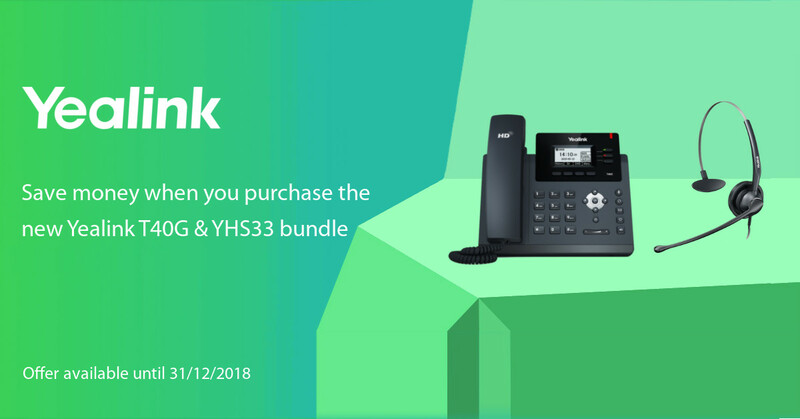 NEW Yealink W53P Bundle Promotions! 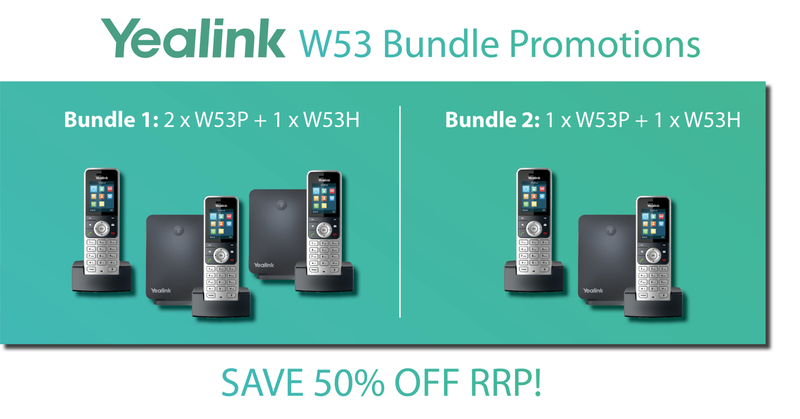 We are delighted to bring you two brand new Yealink bundle promotions for the W53P, available from 4th March 2019 – 31st May 2019, you can now save up to 50% off the RRP! Featuring the W60 base station and the W53H handset, the W53P package offers support for up to 8 handsets and 8 concurrent calls. For ultimate flexibility, the W53P is also compatible with the W52H and the W56H. To purchase either of the above bundles, simply use one of the following part codes: W53P-PROMOBUNDLE1 or W53P-PROMOBUNDLE2 to place your order. 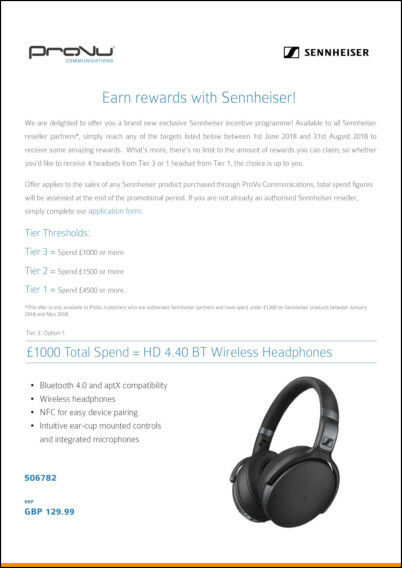 Receive Rewards with Sennheiser with our Exclusive Incentive Programme! We are delighted to announce the launch of our new, exclusive Sennheiser Incentive Programme. Available to ProVu customers only, this new programme entitles you to claim rewards based on how much you spend on Sennheiser products from 1st June – 31st August 2018! Becoming an authorised Sennheiser couldn’t be easier, simply complete our application form and start working towards your reward! 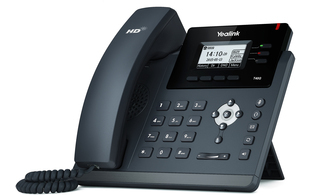 The New Yealink CP920 has Arrived! 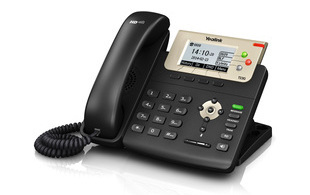 There’s a new conference phone in the Yealink CP range. Ideal for small to medium-sized businesses, the new CP920 is now in stock and available to order from ProVu. 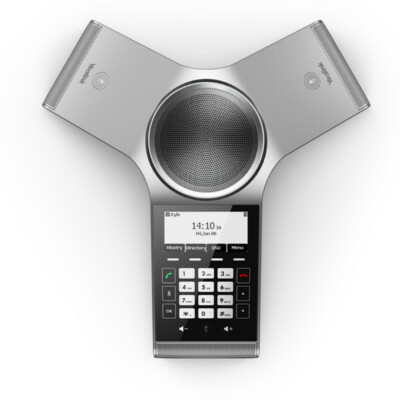 As the replacement for the CP860 model, the CP920 offers a hybrid UC meeting solution with WiFi and Bluetooth connectivity. As part of this launch, we are delighted to offer you an exclusive introductory offer! * Available until 31st March 2018, simply purchase any of the following bundles to make some great savings. *Please note: This offer is limited to 2 bundles per company, and is not available through ProSys – please speak to a member of the ProVu team to place your order. WEBINAR: Why Combine Snom with 3CX? 3CX offers an award-winning software-based IP phone system that works with a combination of SIP standard based IP phones, SIP trunks and VoIP gateways to provide an easy-to-use full PBX solution. Team this powerful solution with the entire Snom range of IP desk and DECT phones and you have the optimal communications package. Discover more about the capabilities of these compatible products in our upcoming webinar on Thursday 25th January at 11 am when we will be joined by representatives of Snom and 3CX to share with you some of the key reasons why they offer the ideal solutions to your installations. We’re kicking off the New Year with a brand new, exclusive promotion for ProVu resellers! Available now until the end of 2018, ProVu resellers will receive a FREE Snom M9r DECT base station and handset when they purchase a 3CX licence with any combination of 10 Snom desk phones. What’s more, this offer is not limited to one free handset per order, for example, if you order a 3CX licence with 50 Snom desk phones, you’ll receive 5 M9r DECT base stations and handsets absolutely free! To take advantage of this great offer, simply contact the ProVu Sales Team on 01484 840048 or email contact@provu.co.uk.